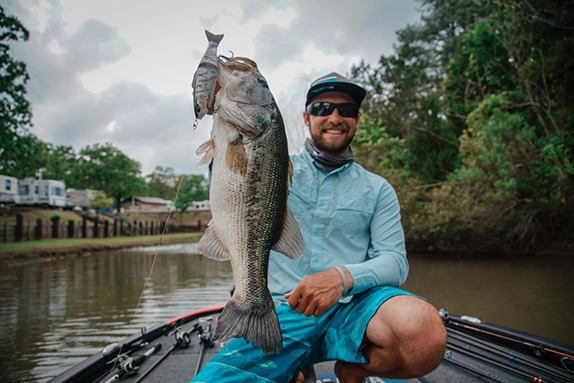 Bub Tosh averaged 12 1/2 pounds per day en route to winning the 2018 WON Bass U.S. Open. 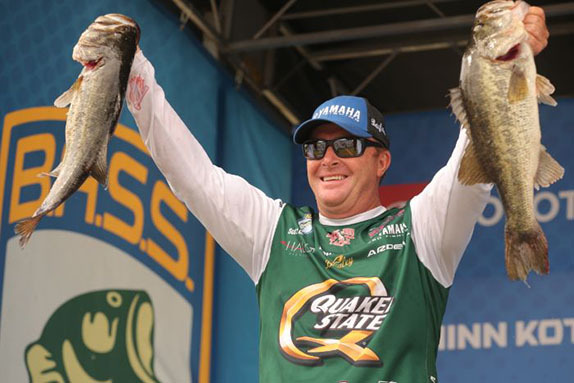 Bub Tosh's victory at the WON Bass U.S. Open was the culmination of a big year for the 38-year-old former FLW Tour pro. It came on the heels of wins in two of the four Wild West Bass Trail Pro-Ams (Lake Don Pedro and the California Delta) and a couple of strong finishes in Western FLW Series events (10th at Clear Lake at 16th at the Delta). According to Tosh, his triumph last week at Nevada's Lake Mead was destined to happen. "When it's your time, you really can't (mess) it up." He compiled a 24.94 total over two days (the first day was canceled due to powerful winds) to eclipse runner-up Nick Salvucci by just over six-tenths of a pound. His prize haul included a fully-rigged Bass Cat Puma, $52,000 in cash and a couple thousand more in contingencies. This marked the third time Tosh has competed in the U.S. Open. He made an inauspicious debut two decades ago, then finished 4th in last year's edition. "Last year I only practiced for a day and a half," he said. "This time I got four full days and I felt way more comfortable going into the tournament." He devoted all of his preparation time to finding baitfish and trying to figure out their daily movements. He discovered shad in about 10 different coves that were using depths from 3 feet all the way down to 33. 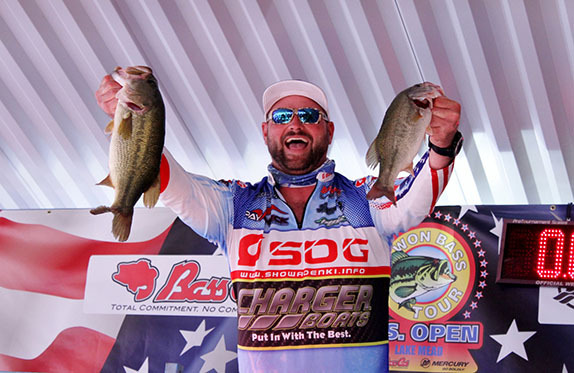 Grass was a critically important factor � the shad got tighter and tighter to the vegetation as the storm that canceled the first competition day approached. "It was pushing them to the only cover they had available and they were using it," he said. He eventually learned that the shad were attracting juvenile striped bass, of which he caught two. The little stripers, in turn, were firing up the lakes bigger largemouth, so the places in which that phenomenon was occurring represented the ideal scenario. "I just adapted to the conditions every day and I ran around more than guys think I did," he said. "I needed active fish that were pushing bait, not ones that had fed all night and were resting during the day. "There's no book on it � you're gambling on your decisions either way. If the baby stripers weren't in there eating shad, I didn't need to be there. I'd go to the next area and try to find a place where the bait was set up." A double fluke-style rig featuring Yamamoto D-Shads produced most of his weigh-in fish. 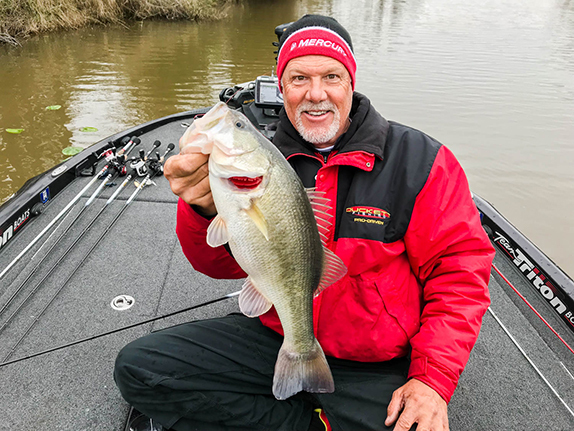 He also utilized a single D-Shad on occasion and he threw a couple of topwaters (the One and the Repo Man, produced by his own Paycheck Baits) that got a lot of fish to reveal their locations. 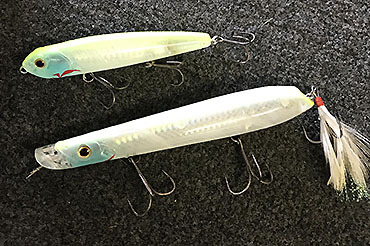 Tosh used two Paycheck Baits topwaters � the Repo Man (top) and the One, to locate active fish at Lake Mead. "I had some huge blowups," he said. "They'd come out of the water and try to land on top of the bait like a tuna. That gave me confidence to keep hanging around those areas." Quite a few of his key bites came during periods of schooling activity. "I kept my (triple-A) partners involved � you can't just isolate them in the back of the boat," he said. "When you catch one, you need somebody to throw in there and hook another fish while they're still schooling. You could end up catching five or six fish instead of just one or two." > Fluke-rig gear: 7'3" medium-heavy iRod Crusher rod, Shimano Bantam casting reel (7:1 ratio), 30-pound unnamed braided line (main line), homemade 3-way swivel, 15-pound unnamed flurocarbon leaders, 5/0 Gamakatsu offset-shank hooks, Yamamoto D-Shads (various white-ish colors). > His leaders were a maximum of 15 inches � any longer and the baits were difficult to propel through the wind. > He threw his topwater baits on 30-pound braid. "You can just cast so much farther with it than you can with 50-pound." > Main factor in his success � "I'm a junk-fisherman and a graph-fisherman by trade and I never got outside my comfort zone. I stayed within my arsenal and stuck to the plan. That can fail miserably sometimes, but I know that going in." > Performance edge � "I don't care what (brand) of graph you have, you need to be able to use it and understand what you're seeing. You need to be able to identify what is and isn't bass and if they're not bass, don't waste your time on them."